Kronomyth 6.3: The tunnel of life. The third single from Brothers In Arms originally appeared as the flip side to “So Far Away,” suggesting that someone at the record company thought this was a marginal, good-time shuffler. Instead, it went on to become one of their highest-charting singles, handily outperforming “So Far Away” on the charts. While many have conjectured as to the song’s meaning, I’ve always heard this as a return to the semi-autobiographical style first revealed on “Sultans of Swing,” in which Mark Knopfler uses the musician in the story as a proxy for himself. That would explain the line “He do the song about the knife,” referring of course to “Six Blade Knife” from Dire Straits’ debut (“the song about the sweet lovin’ woman” might refer to any of several Dire Straits songs). 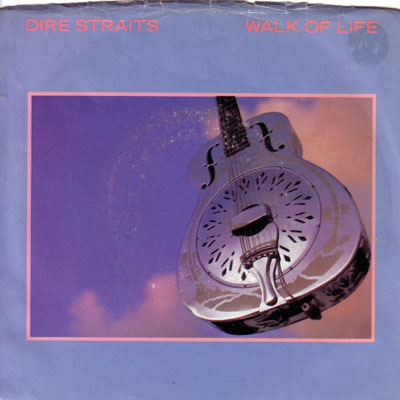 As for what the “walk of life” is, I’ve always felt it meant our real lives, as opposed to the temporary escape we get from listening to a song or, in the case of Johnny/Knopfler, performing it. Once the song is over, both return to their regular walks. On a side note, “Walk of Life” has always reminded me of Talking Head’s “Road To Nowhere,” which was a hit around the same time; must be something to do with that accordion-like melody. In most regions, the album track “One World” was selected as the B side, although Vertigo played it safer by pressing the old Alchemy track, “Two Young Lovers,” into service. A double 7-inch release paired this single with their first, “Sultans of Swing” b/w “Eastbound Train (live),” which sort of supports my theory. * Additional tracks available on double 7-inch single. Released on 7-inch, double 7-inch and 12-inch single in October 1985 in the US (Warner Bros., 7-28878), in December 1985 in the UK (Vertigo, DSTR/D 12/1212), on December 1, 1985 in Japan (Vertigo, 7PP-192), in 1985 in Germany, the Netherland and New Zealand (Vertigo, 880 940-7) and in February 1986 in Australia (Vertigo, 884 397-7) with picture sleeve; reached #7 on the US charts (charted on November 2, 1985 for 21 weeks) and #2 on the UK charts. Also released as promotional 12-inch single in 1985 in the US (Warner Bros., PRO-A-2384) and Canada (Vertigo, DJV-152) feat. A only.